The excursion begins at the Old Toll Gate, the start of the South-Eastern Freeway and a regular meeting place for many of Adelaide’s bike riders. Chances are you’ve already been riding gently uphill to get to the Toll Gate, so you should be nicely warmed up and ready for the climb. If you still need to find your legs, the next stretch will help immensely. After traversing the veloway that runs alongside, but separately to, the freeway, you will arrive at the All Pets Boarding Village. You may well be breathing a little heavily, and it’s probably not the worst time to stop and have a quick drink. Leaving the canine hotel behind, the veloway joins Mount Barker Road for a picturesque climb through the evocatively named Devils Elbow and beyond, just about all the way up to Crafers. Although vehicular traffic is allowed on the road, it’s doubtful you’ll see any. In any event, there are generous bike lanes provided. You’ll pass the entrance to the highly-regarded Eagle Mountain Bike Park (on the other side of the road), as well as the historic locality of Eagle on the Hill. 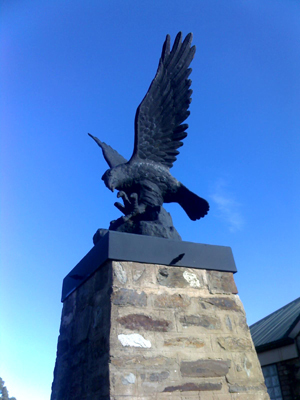 This was the location of the popular Eagle on the Hill Hotel for almost 150 years, surviving two bushfire maulings, before finally succumbing to something altogether different in 2000. The new freeway was opened, bypassing the establishment, and the passing trade disappeared. As Crafers nears, riders pass through a set of bollards at the top of a climb, onto Shurdington Road and then Epiphany Place, weaving and wending their way to the roundabout that offers the left-hand turn onto Mt Lofty Summit Road. There’s more climbing here, in fact it is a steady rise all the way from the Toll Gate to the summit, but it’s manageable. This last stretch of road does get a bit of traffic, and can be narrow in parts, so it pays to stay as close to the edge of the bitumen as possible. It’s largely uphill, but there are a few moments of relief before the last test. A short spike just before the summit itself will see most riders working the gears. 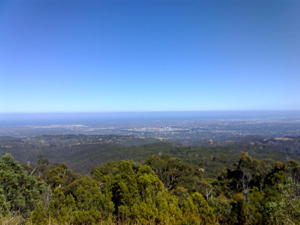 Mt Lofty Summit is worth the short detour. It provides magnificent views of Adelaide and its environs, as well as an opportunity for coffee and a break. On good days you can see the Yorke Peninsula on the horizon. Continuing onwards to Norton Summit, the ride gets faster. There are more downs than ups, and riders will find themselves hurtling through the sweeping bends at good speeds. Care is required, especially on the beginning of the descent, where the Waterfall Gully-Mt Lofty Summit bushwalking path intersects Mt Lofty Summit Road. The intersection is not too far after the driveway entrance to the Summit Restaurant and Café. The Summit Road takes riders through some beautiful country and onto Woods Hill Road, which eventually spills out onto Lobethal Road just before the little town of Norton Summit. From here the ride gets even faster. Norton Summit Road is a popular stretch with Adelaide’s riding community, in both directions. As we’ve already done our climbing for the day, this is a downhill to be savoured. You’ll probably see loads of riders coming up the hill, but it’s doubtful you’ll see much going down in terms of traffic. You may overtake a slower rider or two, or you may be overtaken by quicker riders - maybe even a car. Motor vehicles, however, are reasonably scarce up there. There are quite a few corners that require some concentration, but won’t slow you down too much. The exhilaration is tempered a little once you reach the bottom of the hills and turn right onto the busy, suburban, Magill Road. It remains a gentle downhill run though, and is still a quick ride back into town. It is gun-barrel straight until you turn left at Sydenham Road and then right onto Chapel and (the other) King William Street. This will bring you onto Dequetteville Terrace and from there it is just a short ride to Rymill Park, where you can reflect on your ride over a coffee or two. For those who like to get the hardest part of their ride done early, this is a near-perfect trek. It is most definitely a ride of two halves, guaranteeing a measure of joy and satisfaction whatever the rider’s preferences.